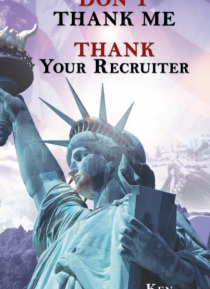 "e;Don't Thank Me, Thank Your Recruiter"e; is a story of a US Army Soldier who served for over 9 years as a Human Resources Specialist. During this time he traveled to a total of 14 countries to include Iraq, Kuwait, Korea, and Afghanistan. Through the years he met various people from all walks of life. During his journey he learned a lot about himself and the world as a whole. This is… a story of true perseverance and courage. "e;Don't Thank Me, Thank Your Recruiter"e; teaches the lesson that it is never too late, nor is it ever wrong to stand up for yourself despite impeccable odds. A true depiction of the Human Spirit, this book is sure to show the world that despite your chosen profession you could still face challenges in life, and work to overcome them. It's not about the size of the dog in the fight, but the size of the fight in the dog that matters.